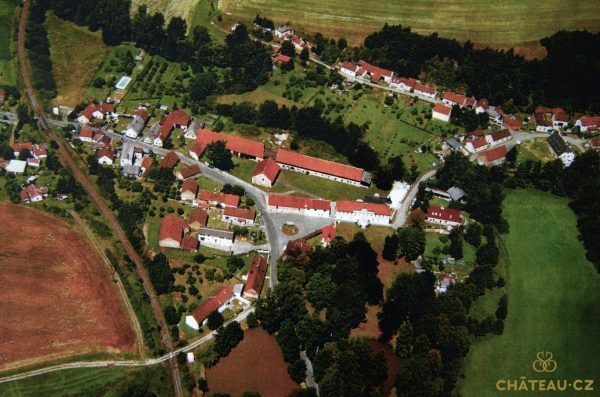 A former manorial château Nahošice of baroque origin is situated in place of a fortress from the 14th century. It gained its current neo-renaissance style with its owners brothers Petr and Jacob Prušák in the second half of the 19th century. Between 1994 and 1995 the château was reconstructed with respect to its original shape and today it incorporates eight flats. A few farming buildings and a château park with a smaller pond belong to the château. The total area of the compound is 2,2 hectares. The two-storey château is located in a village of the same name in Chodsko region, 8 kilometres from Domažlice and 130 kilometres from Prague. The two-storey château is located in a village of the same name near Blížejov, Domažlice district, approximately 130 kilometres from the capital. It was built during the 18th century when it was rebuilt from the original maedieval fortress in baroque style. From baroque period above all the vaults have been preserved in two groundfloor rooms. In the second half of the 19th century the château gained its current neo-renaissance shape. At the beginning of the 20th century last significant alterations to the building were made when it got the rear five-sided turret wherin there also used to be a water tank which was destroyed in 1970. On the opposite side of the château a two-wing staircase was constructed that stretches over the adjoining path and along which you can enter the adjoining château park from the first floor. In the 90ies of the last century the château went through a complete sensitive reconstruction. Its interior was converted into eight flats. The last only partial recontruction took place between 2013 and 2014. The château compound also incorporates a beautiful château park with a smallish pond and a farming building of the barn. The central building of the château has two above-ground floors and a basement. The built area totals 411 square metres. The usable area is approximately 820 square metres. After the last reconstructions 8 living units were made (three four-room flats, two three-room flats one single-room flat with a kitchenette and one single-room flat). The total area of the flats is 546 square metres, the shared spaces 64 square metres. The château building is heated decentrally by an electric boiler and floor heating. The water pipeline brings water from two proper wells that is heated by local electric boilers. Former farming buildings are also parts of the compound. In the building No 2 complete reconstruction was started (new windows, outside door, plaster, change of the majority of beams of the roof trussing, new roof covering including tinsmith´s elements) and on its roof photovoltaic panels 30 kWp have been installed (these started to work on 1st January 2014). The inside spaces of the farming buildings are currently from a part used as storerooms. The farming buildings have their own gas access lines. The plots of the total area of 22.000 square metres belong to château Nahošice, 11.000 square metres of which is the area of the château park.